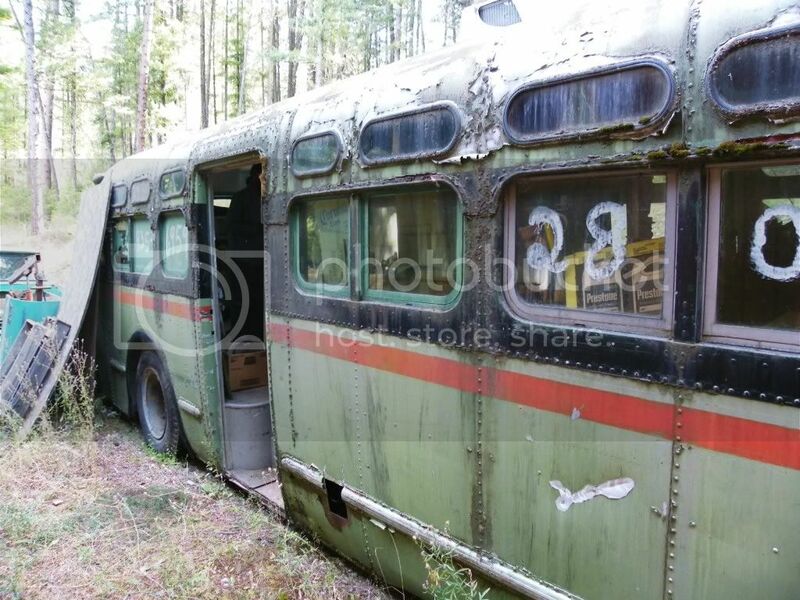 The photograph below is not for sale but the bus in it is at a mere $1,300 and, according to the eBay vendor, it actually still runs! They say that a rolling stone gathers no moss but a bus - that's a different story! This one, located in Chewelah, Washington, is a 1953 GM Coach Model TDH (or M) 4801 - a series specially built for California operators at a length of just under 38 feet to meet that state's weight limits (that restriction was lifted to allow forty foot buses in 1958). Something that you probably wouldn't readily notice about the 4801's, of which 622 were manufactured from 1953 to 1958, is the way GM cleverly arranged the passenger windows as noted by the aft section of the last set just forward of the rear door which is slightly narrower than standard and the larger single sash just aft of the rear door along with the one paired set beyond it also reduced in size. With its all aluminum body and with what you don't see being no worse than what you do see, this coach could conceivably be restored. This would make a great holiday gift for any discerning bus watcher!